A selection of some of the finest castles in the Highlands of Scotland. Urquhart Castle juts out onto Loch Ness and is clearly visible from the opposite shore even in winter when it is lit up. A new Visitors Centre opened summer 2002 and is well worth a visit. A short film show is available with a spectacular ending. Open all year. It was once one of the largest castles in Scotland but was blown up in 1692 to stop it falling into Jacobite hands. The castle can be reached either by going east through the city of Inverness or by going to Fort Augustus at the southernmost end of Loch Ness. Here the many lock gates of the Caledonian Canal enable boating craft to carry on their journeys along the Great Glen. 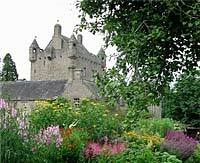 Cawdor Castle is about 33 miles from Camerons and is open to the public from June to October. An interesting tour inside through low doorways and up winding stone stairs. Beautiful gardens especially in the summer months. Go over the drawbridge and into the splendid house and home of The Dowager Countess Cawdor. The local village of Cawdor has an excellent restaurant called The Cawdor Tavern. Dunrobin Castle is a 70 mile trip up the east coast to just beyond the village of Golspie. It is the largest house in the northern Highlands and is an enormous fairy tale castle with a distinctive French-style look with spires and elaborate stonework. It has magnificent gardens inspired by Versailles and an entertaining falconry display in the grounds every afternoon. It is one of Britain's oldest continuously inhabited houses by the Dukes & Earls of Sutherland, dating in part to the early 1300's. 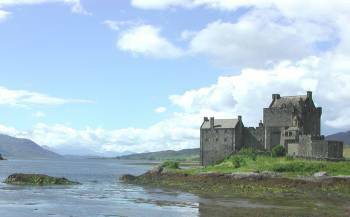 Eilean Donan Castle is on the road to Skye and well worth stopping for a visit. It juts out on an islet on Loch Duich and can be reached by buying a ticket and going over the narrow stone causeway bridge. The mountains on the Isle of Skye can be seen in the background. 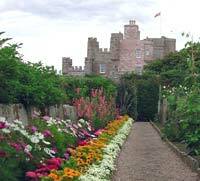 Castle of Mey is at the end of a scenic journey right up the east coast and is a good day trip. This was a favourite summer retreat of the late Queen Mother and you can almost sense her presence there still. It is situated on the most northerly coast of mainland Scotland and has superb views over to the Island of Orkney and the entrance to Scapa Flow via the stretch of water called the Pentland Firth. Brodie Castle just off the A96 on the way to Nairn and dates from 1567, It is a classic Z-shaped Scottish tower house set in lovely grounds with masses of different varieties of daffodils in Spring. Although it is now the property of the National Trust for Scotland, the present Earl of Brodie still lives here. It houses an outstanding collection of fine French furniture, porcelain and an excellent painting collection. Stop nearby at the Brodie Countryfare for restaurants, food hall and quality gift shops. Inverness Castle stands on the River Ness in the city of Inverness. Though its site is ancient, the present red sandstone building only dates from the nineteenth century. It now houses the Sheriff Court.